This week has been a week of up and downs (I know, it’s barely Thursday). On Sunday, my husband surprised me by announcing we were going to our running store to finally purchase the Garmin watch I had been coveting. 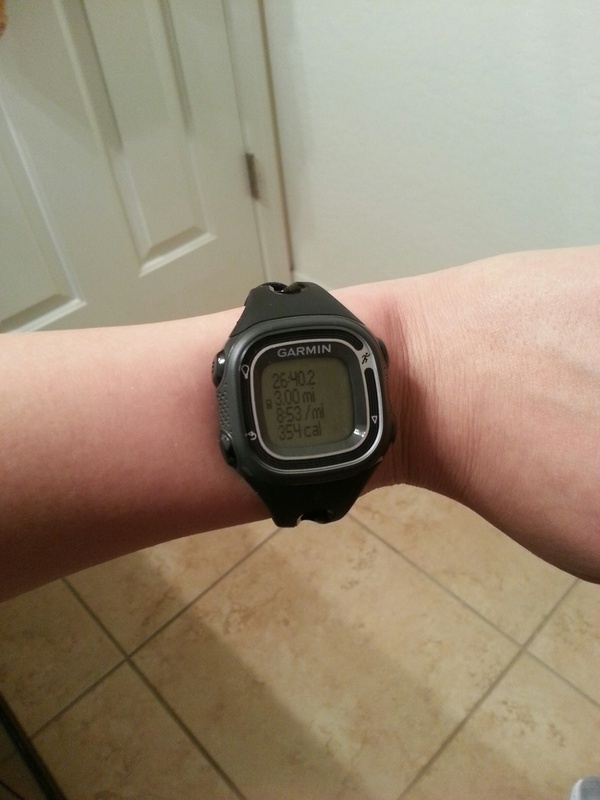 A few of my running buddies have the Garmin Forerunner 10, which they all rave about. It’s not a high tech watch, just a watch with the essentials—time, distance, pace, calories. I’ve used the Nike+ watch and didn’t mind it but like that the Garmin has a larger display (I had the old school Nike+–the one where you had to have specific Nike shoes). She walked me to the watch display and there it was—the exact one I wanted. Sleek, simple, black. “That one,” I said, pointing inside the glass case. My husband knew I’d want to test it out immediately. I decided an easy 3 mile run would be perfect. Finally being able to not have to hold my Galaxy S3 clunker of a phone felt liberating. I felt lighter, swifter….faster. I knew it was partly excitement that was carrying me through my run (my legs had been feeling achy the past few days) but it didn’t matter to me the reason, I was running with my Garmin and I loved it. My legs felt tight and with each step in my cool down I was wincing in pain. This did not feel good. I made Monday a cross training day hoping to give my legs some relief and on Tuesday night I hopped on the treadmill ready for my scheduled 5 mile run. As soon as I started I knew it wasn’t going to happen. I made it to 3 miles and turned off the treadmill defeated. I made a pit stop to my trainer on my way out to tell him of my woes. He immediately knew that what was wrong was the ever dreaded shin splints. I had a vague feeling this could be it but in all my years of running, I’ve never experienced shin splints and I couldn’t understand why now this was happening to me. He said it was likely due to me accumulating a lot of mileage so soon and not incorporating enough cross training. No running for at least two weeks he said. He knew he was killing me with that news. I trust my trainer; he knows me well. The pain wasn’t severe and I felt like I could continue to train but I knew that I could potentially make the situation worse. He knew I was debating this in my head. It’s so frustrating because I feel like I was finally hitting a groove and with a race each month the next four months I know I’ve got a lot of training to do—and then there’s my first marathon in March. I’m hoping two weeks is all it will take. I figure I can experiment with new workouts and include more of the ones I know and enjoy doing. And hope I can have a positive attitude in the meantime. Today is a big day. The NBA season begins. My other love besides running is basketball and people who know me know that I’ve got this date marked on my calendar and that I schedule things in my life so they don’t conflict with games of utmost importance. In fact, my husband (who is also basketball obsessed) and I chose our wedding date so that it was before the season started and we chose the 23rd in honor of our favorite, Michael Jordan. We look forward to Christmas day not only because of presents, food, and family but because of the big triple-header that’s always televised. We think summer officially begins in June after a champion is crowned. Tonight’s game is a big deal. It’s the Miami Heat and the Chicago Bulls. I detest LeBron James and will seriously go in to depression if he wins a third championship. What makes this match up such a big deal is that Chicago’s Derrick Rose is back. Derrick Rose sat out last year due to injuries and many speculate he’ll never regain his MVP status that rivaled LeBron’s. This game is also important because I have a cousin who is a Miami Heat fanatic. I’m not kidding. The first time the Heat won it all he got a Heat tattoo. As in permanent tattoo. He’s gone to LeBron’s Vegas celebrations twice. He constantly updates his facebook status with something about Miami, the Heat, LeBron, or haters. The Heat losing this game, albeit it being the first game, will allow me to plant a seed in his brain that this bad start is an omen of what the future holds for the team. They’re done. They can’t handle the pressure that is a three-peat. They’re too old. They won’t last 82 games. He’ll tell me it’s only the first game but I won’t care. For a basketball fanatic, it’ll be a perfect way to start the season. One of my passions is reading. For as long as I can remember, I’ve loved to read. When I was younger, my parents never had to worry about me as I would be more than content with curling up on the couch with a book and bag of sunflower seeds. I would read anything and everything but my favorite genre, even at a young age, has been crime/mystery/horror. I was obsessed with R.L. Stine’s Goosebumps and Fear Street books and as I got older, Stephen King and Dean Koontz. 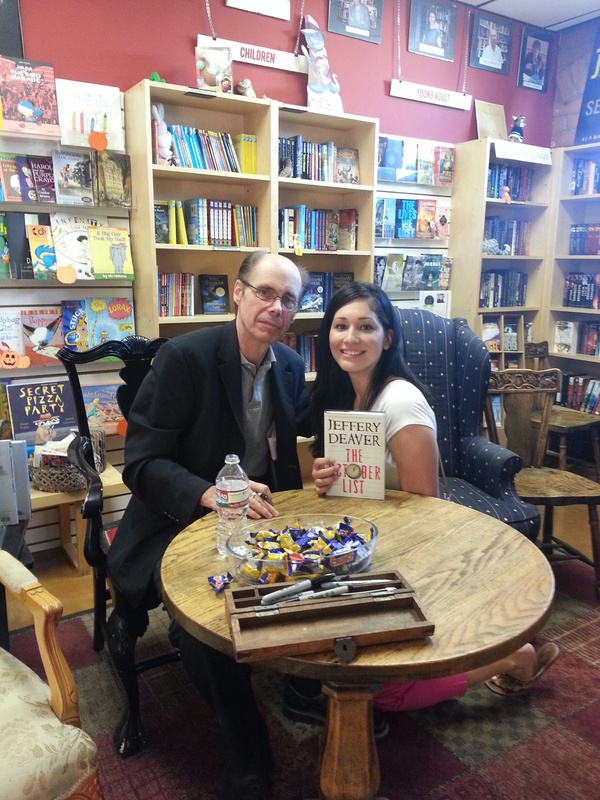 About ten years ago, I discovered a new author, Jeffery Deaver, and instantly I was in love. His books are creepy and very disturbing—which I love. I have no idea what draws me to this genre of literature, it’s hardly intellectually stimulating (although I have learned some pretty interesting things from Deaver—I’ll explain later). The first book I read from him was The Bone Collector which introduced his now most famous character, Lincoln Rhyme. Rhyme is a quadriplegic but is a superman when it comes to forensics. The book is basically about a killer who has a very unusual/terrifying way of murdering his victims and leaves at each scene of the crime a clue–it’s like a game to him (or her). This book was made into a movie starring Denzel Washington as Rhyme and Angelina Jolie as Amelia Sachs, Rhymes’ sidekick. Very rarely do I like movie versions of books and very rarely do I like Angelina Jolie, but both worked incredibly this time around. From there it was one book after another. I couldn’t and still can’t get enough of him. All of his books are very CSI so there is a lot of thinking involved when the reader is trying to solve the mystery. One of the main reasons I like Deaver is that in most of his books he also addresses something related to or happening in society. For example, one of his most recent books, The Kill Room, is about the U. S. government’s involvement in targeted assassinations which some say actually occurs. Another book, The Blue Nowhere, the killer is a computer hacker and the plot hones in on the lack of computer safety knowledge and the amount of access strangers have to personal information. I like that about Deaver, I think it’s this aspect of his writing that makes his books that much more scary—what is happening in the plot could happen to us. The book signing that I went to today was for his newest book, The October List–probably his most unique book in that it is written backward, starting from the end and ending at the beginning. Think the movie Memento. I’m very excited to start reading it.